Editor’s Note: Personal Branding is now a big thing. If you apply for a job then they will check up on you on the internet so setting your own personal branding is key. I was thinking of writing a post on the subject myself and then as if by magic Mark Ellis asked if he could submit an article on a similar topic. In this article he covers blogging as a key way to build your online personal brand. How would you define success as a blogger? After all, if you’re not doing it for commercial reasons and your website is purely a vehicle you use to express yourself, how do you know when you’ve ‘cracked it’? In fact, is it even possible to ‘crack it’, and should you worry about success as a blogger? I’d argue that you should because one of the key problems when it comes to this form of expression is that it’s all too easy to simply give up or let life get in the way. If you’ve started a blog, you clearly did so for a reason, and what a shame it would be for that reason to gradually dilute as you swap writing for the day-to-day activities that once made way for your creative time. Writing regularly on a personal blog is about one thing: creating a brand for yourself. And that might sound odd because the word ‘brand’ is usually reserved for the commercial realm. How could it apply to you as an individual? In the digital age, we’re surrounded by personal brands. Personas displayed on social media platforms, for example, are often rather different to their real-life counterparts, but for good reason; online, we can express ourselves in a variety of ways and be completely unhindered by our inhibitions or the apprehension that is often inherent in social situations. Your personal brand should be whatever you want it to be – and a blog is a great way to foster it. Sure, you might be inspired by another blogger to start your own website, but try and avoid being influenced to the point of imitation. Be yourself on your blog; authenticity is vital, as is personality. Your audience consists of real people, and if you can inspire them with words that are written in a tone that is truly your own, any connections you need to make with them elsewhere (in comments, emails or on social media), will feel authentic for both of you. Who said blogging needs to be solely based on words? The rise in podcasting and ‘vlogging’ (video content) is testament to the ease with which other forms of media can be published by us all. By mixing up traditional blogging with podcasts and pieces you deliver to camera, you’ll build a personal brand that’s vibrant and extends far beyond the written word. What’s more, you can experiment to your heart’s content and see what works. You never know – you might discover a latent talent as a video star! The most successful personal blogs are branded in a consistent way. That means having a theme and sticking to it, but also publishing a piece at least once a week and posting daily on social media. If you decide to reply to every comment – do so, but make sure you stick to it and continue whatever theme you’ve settled on. Blogging isn’t just about writing – it’s about maintaining a website that is functional, highly-available and attractive to search engines. You may consider this tip ‘the boring one’, but by focusing on both content and technical SEO, you’ll be sure to create a web presence that is capable of extending your personal brand far and wide. You can’t create an engaging personal brand overnight – it takes dedication and hard work. That’s why audiences don’t arrive overnight, either. They build, slowly, and take time to warm to you. 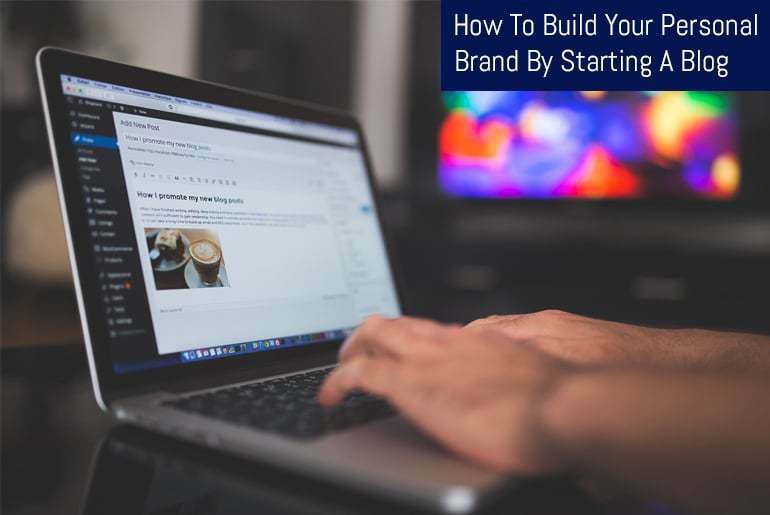 The first steps in creating a personal brand via a blog are challenging and long, but the more you stick with them and remember that it’s all down to you, the quicker that audience will build. Don’t make the mistake of many a blogger who has started something and abandoned it several weeks later. If you try and write for others or for what you believe an audience would want, you’ll drive yourself nuts. You’ll run out of inspiration, quickly, and never feel like you’re building your own brand. Instead, write every post for yourself, and true passion should emerge. From an onlooker’s perspective, that’s rather attractive. As a personal blogger, it’s far better to have a small group of highly-engaged, loyal followers than a massive audience that is only half-interested in what you have to say. Focus on building a relationship with that smaller group. In time, it’ll expand naturally, and avoids the inevitable temptation to purchase followers or seek out the wrong audience when aiming too high. There are thousands of bloggers who make a very comfortable living from writing, but if you’ve started your own blog with a singular goal to make money out of your personal brand, it’ll only end in disappointment. Chasing money online is never a good thing. It makes you focus on numbers rather than quality content and any frustration you feel with a lack of incoming funds will be evident in the stuff you publish. Forget about money when building your personal brand online. The tips above will help you create something which is yours and, more importantly, which you love working on. Monetary success may follow.